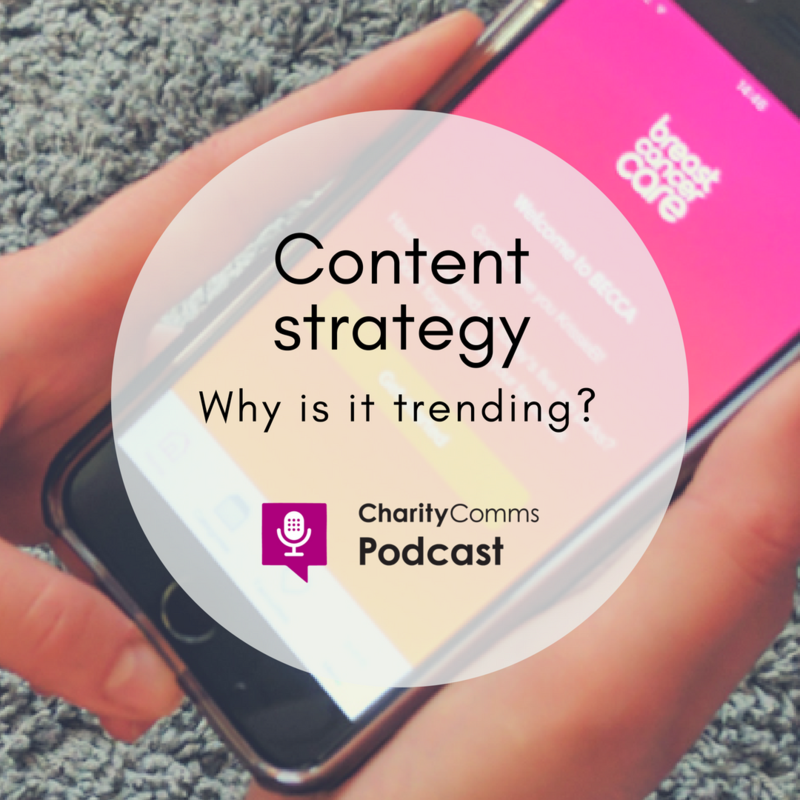 Home › Knowledge Hub › Thought pieces › Podcast: why is content strategy buzzing this year? Attention grabbing colours in fashion, blockchain capabilities in tech and finance, digital interventions in health – these are just some of the trends we’ve seen in 2018. But for digital communications, content strategy has been a surprisingly big deal. Why is content strategy such a hot topic this year? We know content is a foundational part of product design. Increasingly, people see the benefit of maximising existing content, repurposing it across multiple formats and how proper content maintenance can improve ROI. It’s no wonder charities, full of fantastic content, want to ensure their content is delivered in a timely way, and is relevant and appropriate for our audiences. To really get into this subject, we thought we’d bring you interviews from two of the speakers who presented at our Content strategy conference earlier this year. Both have been behind projects that highlight content strategy in action and embrace agile principles to best meet the needs of their audiences. First up is Claudia Knowles, digital content strategist at Breast Cancer Care. We discussed BECCA, the charity’s app designed to provide information, support and inspiration to help people move beyond breast cancer. While apps can be a delicate subject for charity communicators, BECCA is nothing short of a smash hit, currently reaching more than a third of people who have recently finished breast cancer treatment in the UK. We were also joined by Amanda Diamond, content product lead at Government Digital Service (currently seconded to Acas as head of content design) to discuss how she went about managing masses of content – specifically, over 350,000 items on gov.uk. Together, we explored the tools and procedures GDS is developing to ensure the content that is published is high quality, meets the needs of its users and doesn’t inhibit user journeys on the website. If you’re interested in podcasting at your charity, check out this this article on charities that podcast. We’re also keen to hear from people who want to get involved, so drop us an email or tweet us! You can also get in touch with us personally, Robyn’s on Twitter @RobynLewes and Sushi is @sushi_juggapah. Listen to this episode on AudioBoom or from your desktop or download from the podcast app on your iPhone. You can also find it on Spotify. If you need a copy of the full transcription, you can find it here.